I recently read an intriguing story about the Beatles on the Internet (so, therefore it must be true). 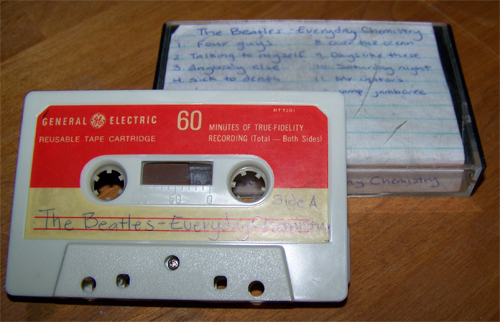 The tale chronicles the misadventures of a mysterious chap named James Richards and how he came into possession of a never-before-heard Beatles album dubbed “Recreational Chemistry” through an incredulous chain of mind-bending events. So the yarn goes, James and his dog were driving through a long stretch of highway in the California desert when they stopped for a rest. The dog must have caught the scent of something as it took off running. As fate would have it, James fell into a rabbit hole while chasing his runaway dog (who was, you guessed it, chasing a rabbit), and wound up knocking his head upon a rock, rendering himself unconscious. Upon waking, he found himself–get ready for it–in a parallel universe, sitting in the living room of a good samaritan who happened to be a huge Beatles fan. The funny thing is that in this parallel universe, the Beatles never broke up. To make a long story short (TOO LATE! ), the hero of this story was safely delivered from this parallel dimension and returned back to his familiar Californian homeland, but not before he nearly disrupted the space-time continuum by stealing this trans-dimensional bootleg from the dusty stereo in his savior’s home. The pervasive guilty feelings that linger after committing such an act were only further substantiated by the stern, disapproving looks he received from his dog, who sat quietly in the passenger seat on the long and winding road back to his home. In retrospect, I’d say his time-traveler bungle was a worthy sacrifice. Beatles fans around the world can now rejoice at the realization of this never before heard intergalactic chestnut entitled, “Over the Ocean”! This one goes out to my Pacific brahs: one is leaving on a flight tonight, bound for the tropical paradise that is Hawa’ii. He’ll be lucky to spend Fatsgiving with none other than the Big Kahuna himself, paniolo of Oahu and devourer of the Humuhumunukunukuapua’a. Have da kine fun dudes! Many happy luaus to all this Thanksgiving! Check out this great new aquatic-themed video from Damon Albarn and his troupe of animated ice pirates, the Gorillaz. The video accompaniment to the bands’ new single documents the obstacle-ridden underwater journey of a sassy soul singer named Daley in his one-man rave-up of a submarine. The coordinates for his secret destination were locked-in at launch; Daley completes his mission in posh style, surfacing safely at Gorillaz HQ on Plastic Beach. If only that submarine came as a two-seater! Doncamatic is released on November 22nd, 2010 as a 7” picture disc, CD single and digital bundle. Take your pick. Phish frontman Trey Anastasio partnered with the New York Philharmonic Orchestra this past Saturday evening at Carnegie Hall for a beautiful rendition of his versatile new composition, Time Turns Elastic. The black tie getups were in full effect with all due respect to the occasion at such a prestigious venue. After the orchestra tuned-up, Trey, carrying his electric guitar, approached the front of the stage with his signature beaming smile, and was greeted by the conductor, Asher Fisch. The music began. The first ’set’ consisted of symphonic renditions of a variety of classic Phish chestnuts. The interpretations were surprisingly engaging and textured, the sound clear and crisp even from our position in the balcony level. They say no seat at Carnegie Hall is a bad one with respect to sound, and I’d have to agree. A highlight of the first set was surely the dynamic and genre-shifting take on ‘Guyute‘, with its rousing and triumphant crescendo, in Wagner-esque fashion. Time Turns Elastic manifesting itself in orchestral format represents the culmination of a lifetime achievement for Trey; a single composition that’s been interpreted and expressed three separate ways: solo, by means of acoustic guitar, as an electric rock “opera” by Phish, and finally, in all its glory with full orchestral accompaniment at Carnegie Hall. A trifecta of that scale is quite an achievement for a performer by any standard, but it’s also a wonderful experience for a listener as well. Back in the Springtime, Phish released a sparse acoustic treatment of Trey playing TTE at The Barn, their private studio outside of Burlington, VT. By early Summer, Phish teased it’s fanbase with a short video of a electric studio rehearsal of TTE promoting the itunes release of the song, the first new studio release from the band in over 5 years. Days later, we found ourselves in the hallowed grounds of Boston’s Fenway Park for Phish’s first show of their 2009 Summer Tour. The live debut of TTE arrived midway during the second set but was hampered by deplorable acoustics (Fenway is the antithesis of Carnegie Hall from a sound perspective). Thankfully, we had the good fortune of hearing TTE live at several other shows over the course of the summer, the best version of which may have been served up a week after the Fenway show amidst the swirling evening rains at Jones Beach Amphitheatre on Long Island, NY in early June. How fitting to complete the TTE trilogy at the hallowed Carnegie Hall while wearing a tuxedo, pockets full of complimentary Ricola. Last but not least, Trey and the Philharmonic presented the orchestral debut of the Vermont quartet’s seminal tune: You Enjoy Myself, for the finale of the concert. Transcending the parameters of traditional classic music, this particular piece was infused with shuffling latin rhythms, syncopated staccato guitar licks and above all, humor. In typical Phish fashion, the translated composition of YEM from prog-rock epic to classical movement effectively leveraged the audience’s familiarity with the composition to its full advantage. Instead of heavily anticipated and beloved guitar chords, elephantine horns squealed out in whoopie-cushion fashion, timely deflations that incited peals of laughter from the audience and orchestra alike. Personally, I’m still trying to figure out what impressed me most, Trey’s virtuosity on guitar or his stunning vocal chops. Not only did he nail virtually every single note of these composed pieces on acoustic and electric guitar, the guy also sang like a bird, his warm and familiar tones tastefully accented with warbling vibrato. Mind you, this is a man who is no stranger to playing in front of crowds of up to 80,000 roaring fans, but I have a feeling that standing in front of Carnegie Hall and singing your heart out without the cover of a backing band is somehow much more difficult. Phish band-mate Mike Gordon was once quoted giving Trey some constructive criticism after a show in Europe, saying, “I thought you were kind of going off a little…Well, I mean you just were playing a lot of notes”. Anyone familiar with Trey’s proclivity for musical exploration and virtuoso improvisation will likely relate to Mike’s feedback. Although Mike, who is currently on tour with his own band, wasn’t in attendance, I’m sure he’d agree that Trey played just the right number of notes on Saturday night. At concert’s end, a standing ovation and the satiated smiles of performer and listener alike were testament to the success of the project.